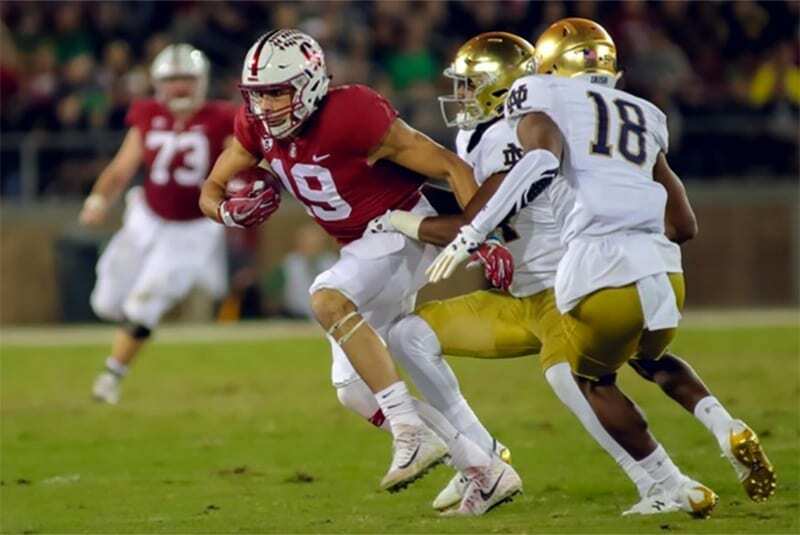 The seventh-ranked Stanford and eighth-ranked Notre Dame renew their non-conference rivalry this Saturday where one team will fall from the ranks of the unbeaten and that team will have their BCS playoff chances hurt. This is one of the hottest betting affairs of the young NCAA Football season to date. Stanford is coming off a HUGE 38-31 OT win over a ranked Oregon team in their last game where they made a big comeback. They could have been down 3-7 in the 3rd quarter, but a Ducks TD was overturned and on the next play the Cardinal recovered a fumble and took it all the way back for a TD. Heisman candidate Bryce Love did not have a big game, but you can be sure he will get his touches in this one facing Notre Dame. The Fighting Irish played three close games to start their season, but then had a blowout win in their last game. The squad has found their QB in Ian Book, who rushed for three touchdowns and rushed for two more in Notre Dame’s last game, which was a 56-27 win over Wake Forest. This season Stanford is 4-0 SU with an ATS record of 3-1 and an O/U record of 1-3 and Notre Dame is also at 4-0 with an ATS record of 2-2 and an O/U record of 1-3. The underdog has covered the spread in the last six games between these teams. Last season in this matchup Notre Dame was the 8th ranked team in the nation like in this game, but the game was at Stanford with the Cardinal beating the Fighting Irish 38-20. The last time they met at Notre Dame in 2016 Stanford beat them 17-10. In their last game Stanford beat Oregon 38-31 in OT even though they were out-gained 524 yards to 398 yards and only rushed for 71 yards. The Cardinal took advantage of three turnovers and they did not have one. K.J. Costello came up big passing for 327 yards with three touchdowns and no interceptions and Kaden Smith and JJ Arcega-Whiteside combined for 179 receiving yards. Bryce Love was the Heisman runner-up last season, but this season he only has 254 rushing yards. However, after struggling in his first game of the season he rushed for 136 yards in the win over a ranked USC team before not playing in the next game. In the win over Oregon he rushed for 89 yards and averaged a solid 4.7 yards per carry, but the Cardinal had to go to the air more since they were down big. Stanford will be facing a Notre Dame defense that ranks 76th in the nation defending the pass and 62nd defending the run. Notre Dame beat Wake Forest 56-27 in their last game where they racked up 566 yards. They had balance in the game with a solid pass and run attack and Ian Book had a great first start passing for 325 yards with two TD and he was not picked off. Jafar Armstrong and Book combined for 141 yards with five TD and they will be up against a Stanford run defense that ranks 38th in the nation. The underdog has covered the spread in the last six games between these teams and that betting trend will continue. This will be Love’s big breakout game and he will have a big game on the ground facing a Notre Dame defense that gave up 259 rushing yards in their last game. I not only think Stanford will cover the spread getting 4.5 points, but they will get the win as well.